Sugar Free Sweets Selection Jar - a new selection of old favourites - introduced by popular demand. 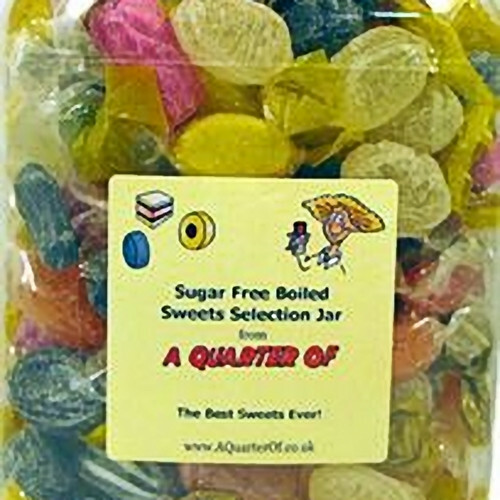 A jar of assorted old sweet favourites with a selection which will vary but is likely to include rhubarb and custard, pear drops, blackcurrant and liquorice and stacks more - and no sugar at all!!! We choose the sweets to make sure that there is a really good selection - and we cram in as many as we can. Officially we say that the sweets weigh 1.8kg - but really they may weigh a fair bit more (depending on the selection)! Advisory - Eating Sugar Free sweets in large quantities may have a laxative effect.